Since I haven't done much posting here on the good ol' blog I thought I'd hop on and at least give you a few links to some recent projects I've had popping up around the web this week. Something is better than nothing, right? I had this layout go live in the Garden over at Two Peas In A Bucket on Monday. LOVE LOVE LOVE these photos of my sweet niece Gia that I snapped at her second birthday party last month. Isn't she precious? I used the adorable Cakewalk collection from October Afternoon on this layout. I also had a new Finally Friday video go live a few days ago. August is all about back to school at Two Peas (although we don't actually go back to school until September here in NJ). I used the fantastic Basic Grey Clippings collection for this card. Click here to see the video. 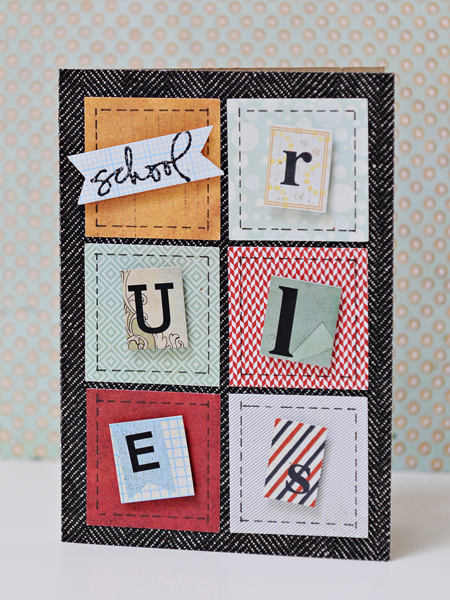 I also had a few blog posts go up on the Scrapbook & Cards Today blog. 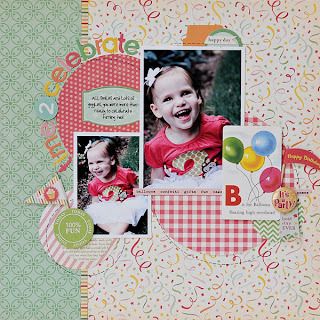 To take a peek into my scrapbook room check out this blog post. To see one of my CHA-S projects using the Serenade collection from Basic Grey check out this blog post. And to enter a giveaway to win the Serenade line before it hits store be sure to stop by and leave a comment on the Scrapbook & Cards Today blog here (comments must be left on the SCT blog NOT on my blog). I hope you are feeling better!! Hopefully your vacation will be lots of relaxing... Been seeing all of your beautiful projects all around the web. :) And your scrappy space is beautiful!! There is a house going up in our neighborhood. They are having a bonus room above the garage. Dormer windows and a big window at the end. A girl can dream, right? :) I would love to get out of the cave in my basement. he!he! Hi Lynn, hope you'll feel better soon! Rest up and take the time you need (guilt free). Love the birthday layout too. So adorable. Just popping in to say that I hope you are feeling MUCH MUCH better and that I miss seeing you here at at 2Peas. Thinking of you today and saying a prayer too.